At the top of Saddler Street, Durham, near the castle, is an early nineteenth-century building. 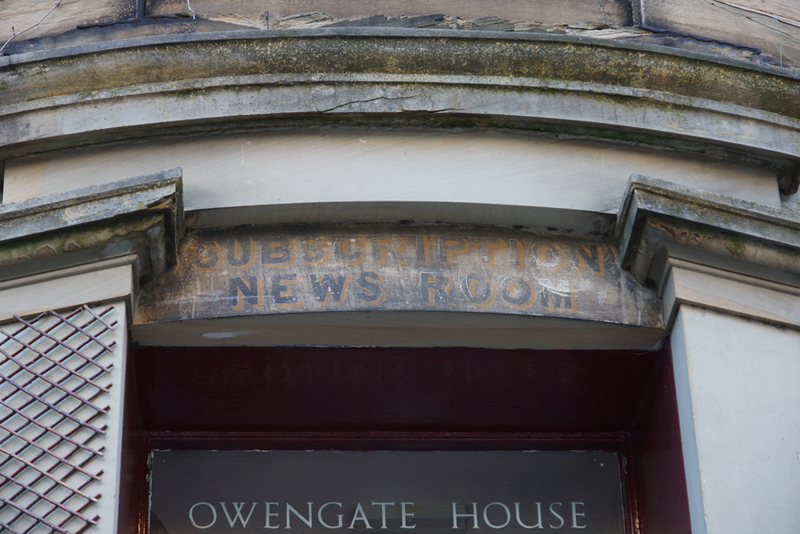 Above its door is a painted sign: Subscription News Room. When newspapers and journals were expensive, joining such an organisation allowed a wide range of reading in return for an annual subscription - and usually a comfortable and pleasant environment in which to read. 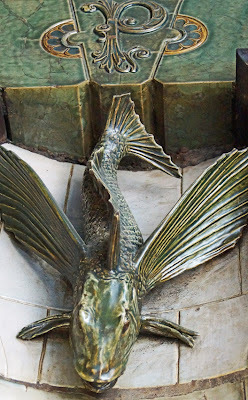 The sinuous ceramic fish I shared a few days ago is just one of the decorative features in the lobby of Lloyd's Bank, Law Court Branch. One of the treasures of Fleet Street and Strand, it offers perhaps the most extraordinary surroundings for a cashpoint in the city. In fact, the bank's history is closely connected with that of the tea shop nearby at 216 Strand. Twining's is the oldest shop in London still housing its original business, although the company's teas are now a national brand. In 1825, over a century after opening the shop, the Twining family moved into banking with an office at Devereux Court. It was just one room, holding a safe, desk and a clerk, and handled business mainly for the family. Expansion was rapid, and very soon the bank was building new premises at 215 Strand, complete with connecting door to the shop. In 1892, the bank merged with Lloyd's and three years later it moved to the current branch at 222 Strand. A year earlier, Praed's bank had also merged with Lloyd's and its 169 Fleet Street office was also transferred here. In fact, the building was not purpose-built but had opened as a hotel restaurant in 1883 before it was converted from food to finance. 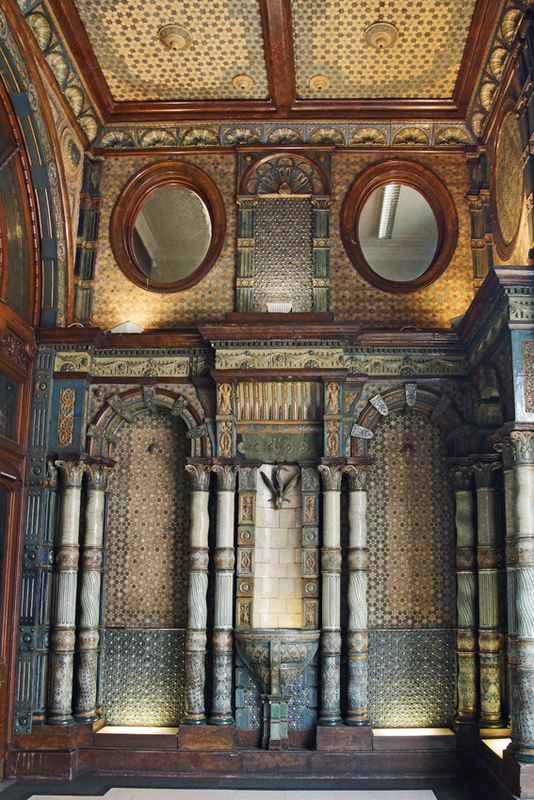 It was the work of architect G Cuthbert, decorated with Doulton tiles painted by J H McLennan. The 'P' incorporated into the design is for Palsgrove Hotel. The Twining family connection to the bank did not end with the merger. Herbert Haynes Twining was its manager until 1917, when he retired. His son had started work in the bank in 1909, but died near Ypres in the First World War - and the family connection with this branch died with him. 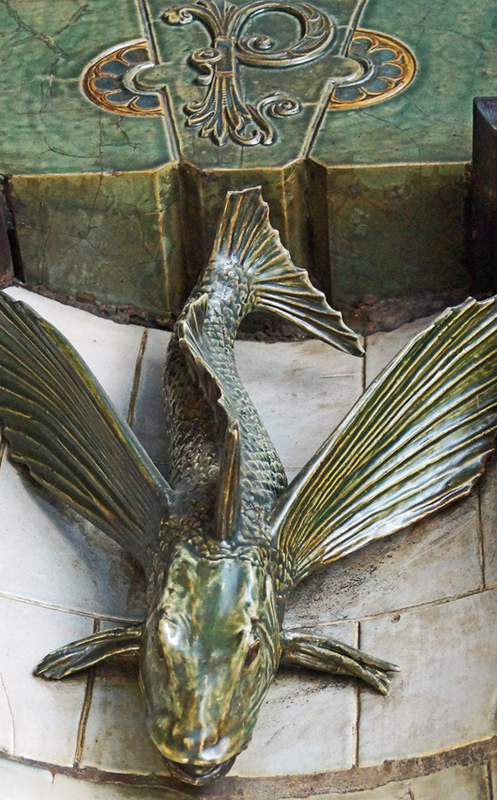 Where in London would you find this fine fish? In 1910, a Japanese-British Exhibition was held in White City. Among its attractions was a large and elaborate gateway, a four-fifths size replica of the Gate of Nishi Hongan-Ji in Kyoto. The following year, after the exhibition closed, the gateway was moved to Kew Gardens where it still stands. During restoration in 1995, the lead-covered bark shingles on its roof were replaced with more traditional copper tiles. This building, its location and its history do not only commemorate British interest in Japanese culture but also raise more complex questions about the meanings of such cultural exchange. Exhibition-goers' interest in Japan was perhaps rather different in nature to the curiosity of visitors to 'human zoo' exhibitions of the same period. (The Japanese empire, however, was represented by the exhibiting of Ainu and Formosan people.) Not only had Japan never been a European colony, but until the mid-nineteenth century it had been closed to the West. When borders were opened in 1854, a fascination with all things Japanese followed. 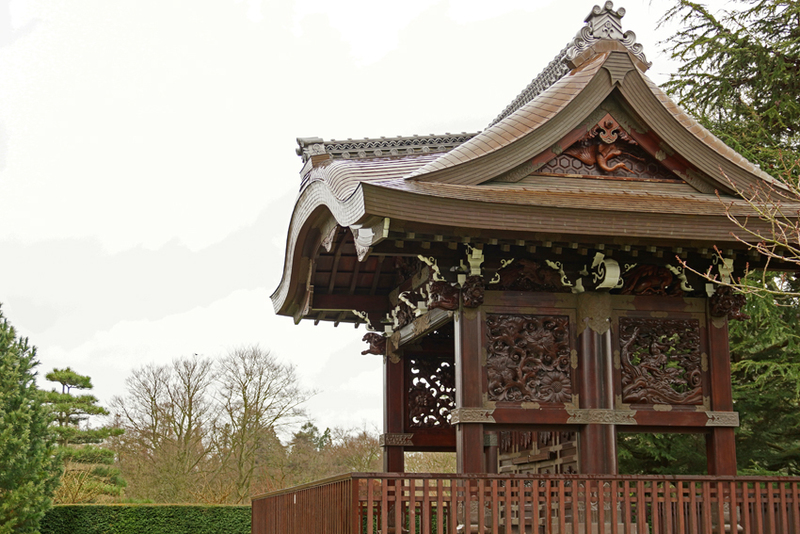 Kew was among many collectors of the newly-available Japanese plants, but a fashion for Japanese gardens came somewhat later. Leopold de Rothschild created a much-admired garden in the 1880s, in nearby Gunnersbury Park. 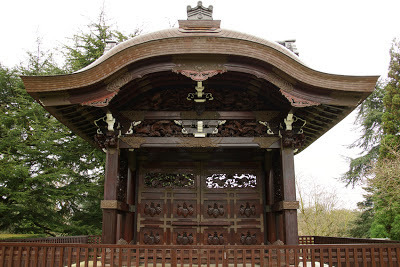 The 1910 exhibition stimulated this British interest: two gardens were created by Japanese designers and workmen, using trees, plants, wooden features and stones sent from Japan. However, the authenticity of most British 'Japanese' gardens was usually only partial, which we can view either as a process of cultural fusion or as a more problematic act of appropriation. It was probably both, in varying degrees. For an apparently clearer example of cultural appropriation, we need not move from the site of Kew's Japanese Gateway, a rise of ground known as Mossy Hill. This name refers not to the vegetation found here but to the mosque which previously occupied it. In the eighteenth century, Sir William Chambers (architect to the Gardens' then-owner Augusta, Dowager Princess of Wales) would build not only the famous pagoda but also, in 1762, a 'Turkish mosque'. It was in fact neither Turkish nor a functioning mosque; imitations followed in the Schloss Garten at Schwetzingen and in Armainvilliers near Paris in the following decades, but none were genuine places of worship. 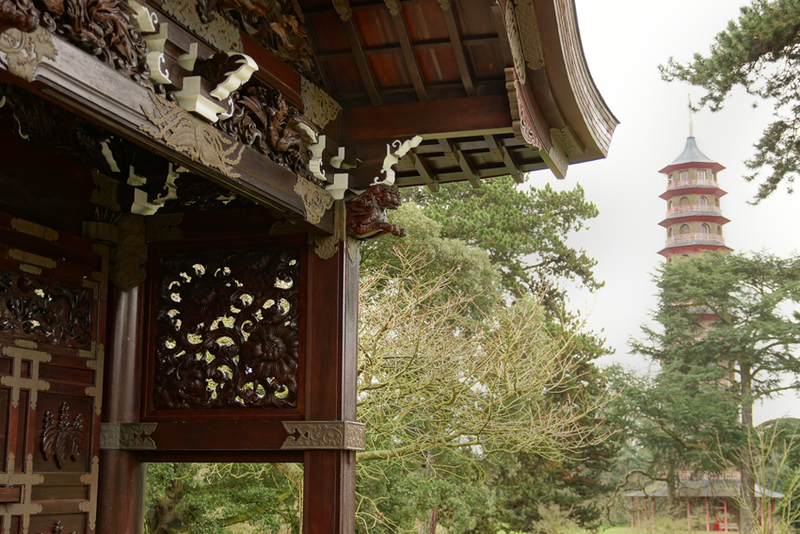 Instead, they were exotic novelties much like Brighton's Royal Pavilion or the aforementioned, and famously inauthentic, Kew Pagoda. Britain's first mosque would not be built until 1889, in Woking, Surrey. Again, though, the picture needs to be complicated a little. Turkey was the heart of the Ottoman Empire, one of the great imperial powers of Europe when the 'mosque' was built. Nebahat Avcıoğlu argues that through Kew's Chinese and Turkish buildings, the royal family was in fact attempting to legitimise its own imperial ambitions by association. In addition, the mosque functioned as an Enlightenment metaphor for religious tolerance. Finally, the design of the mosque - including the incorporation of Qu'ranic inscriptions - was not purely fanciful but indicated an acquaintance with both Ottoman architecture and Islam. Should we be pleased that Georgian England had such interest in Turkish and Islamic culture and architecture, or horrified that sacred forms were casually appropriated for secular places of amusement? Is an openness to other cultures inevitably limited by only partial understanding of them? Is imitation really the sincerest form of flattery? Kew Gardens show us tensions which are perhaps inevitable in any cultural exchange: maybe the issue is whether we are aware of them, and the extent to which genuine interest and curiosity outweigh objectification and exploitation. These questions are not purely historical, although the contexts have sometimes changed dramatically: in modern China, it is the English town which is being recreated as exotic curiosity. Today, Sir Thomas Myddelton (c1550-1631) is pretty much forgotten in favour of his younger brother Hugh of New River fame. However, Thomas was pretty important and successful in his own right: knighted by James I, he became Lord Mayor of London in 1613 and an MP for the city in 1624. Thomas was originally apprenticed as a grocer but became a wealthy merchant as well as an influential alderman. He traded in sugar and built a refinery in Mincing Lane, was one of the founders of the East India Company and had invested in Drake's and Raleigh's privateering expeditions (many of these activities we would consider ethically dubious today, but were a good way to gain money and influence then). Much of his investment would have been funded by his position as surveyor of the customs and excise: it was accepted that monies collected in this post could be used for private speculation until they were due to be handed to the exchequer. Myddelton divided his time between London and Wales. He purchased Chirk Castle in Denbighshire for £4,800 in 1595 and converted it from a mediaeval fortress to a comfortable Tudor home. Later, he gave it to his son as a wedding present. Other contacts with his home country included the provisions of loans to hundreds of fellow Welsh people. He also funded the publication of religious books in Welsh, including the first portable bible. Image: Chirk Castle by Prichardson on wikipedia. 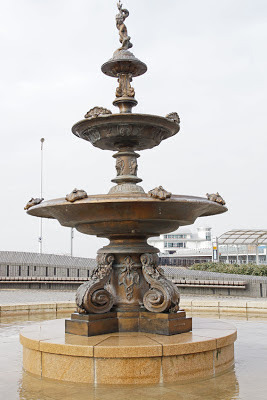 I'm very fond of cast-iron fountains, and Weston-super-Mare has a lovely example on the sea front. It has been in place since 1913, and was recently restored so it's celebrating its centenary in style. A plaque on the base states that the fountain was presented to the town by Thomas Macfarlane, chairman of the town's Urban District Council. His great-grandaughter switched the fountain back on after its restoration. 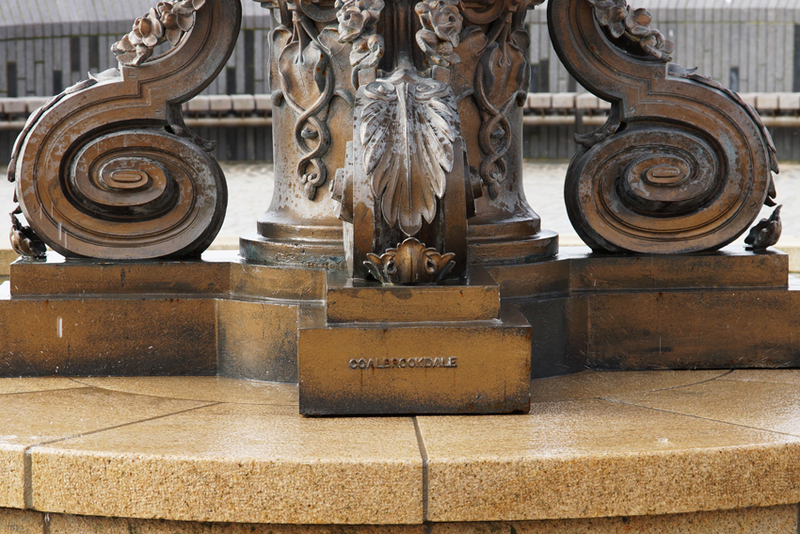 The fountain itself bears a clear foundry mark: Coalbrookdale. Located in the Ironbridge gorge, and at the heart of the Industrial Revolution, the Coalbrookdale company was founded by Abraham Darby. It had begun making cast-iron rails in the eighteenth century and achieved fame for the gorge's famous Iron Bridge, the world's first cast-iron bridge. The boiler and engine for Trevithick's steam locomotive were made here. In the nineteenth century, it made everything from stoves to furniture to shop fronts. 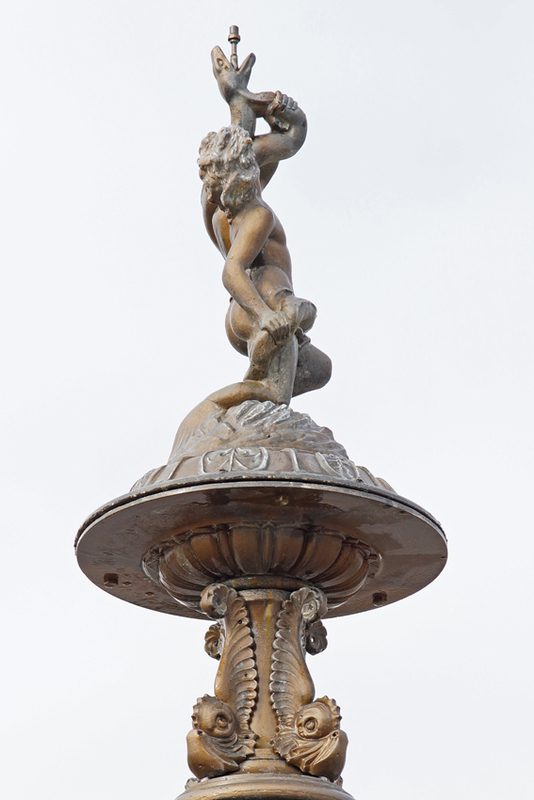 Not least, the company produced much decorative ironwork, ranging from gates for Hyde Park to this lovely fountain. The Painted Hall of the Old Royal Naval College, Greenwich is one of Britain's baroque masterpieces. It has also spent the last three centuries as a tourist attraction, so the elaborate decoration has not had an easy time! 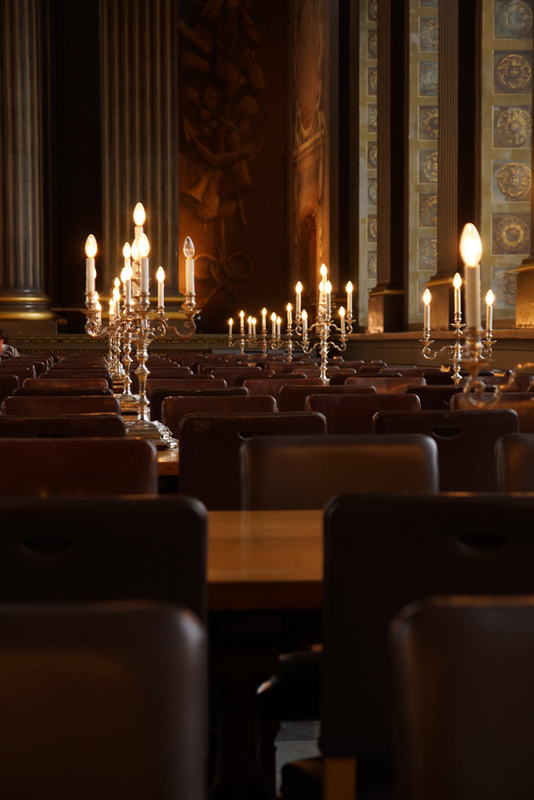 Back in the site's days as the Royal Hospital, it needed a dining hall. 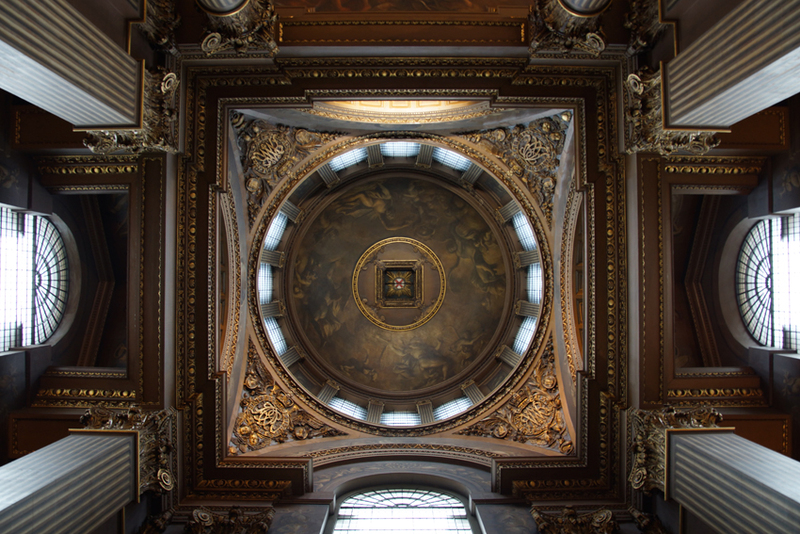 Architect Sir Christopher Wren and artist James Thornhill worked together here as they already had on St Paul's Cathedral (where Thornhill painted scenes from the life of St Paul inside its dome). It took nineteen years - which must have made his employers glad they were paying Thornhill by the square yard rather than the hour. 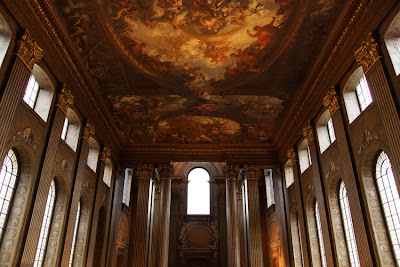 In 1727 the work was finally completed. The lavishly-painted room with its pillars and carved wood was, however, considered a rather elaborate space for naval veterans to eat their dinner. Instead of dining in it, the Pensioners got to act as tour guides for paying visitors. And the visitors have been coming ever since. In 1806, they could pay their respects to Nelson who lay in state here, three months after dying at the Battle of Trafalgar. During most of the nineteenth century, they got to look at naval paintings - later part of the original National Maritime Museum collection. Today, the decoration is the main attraction. 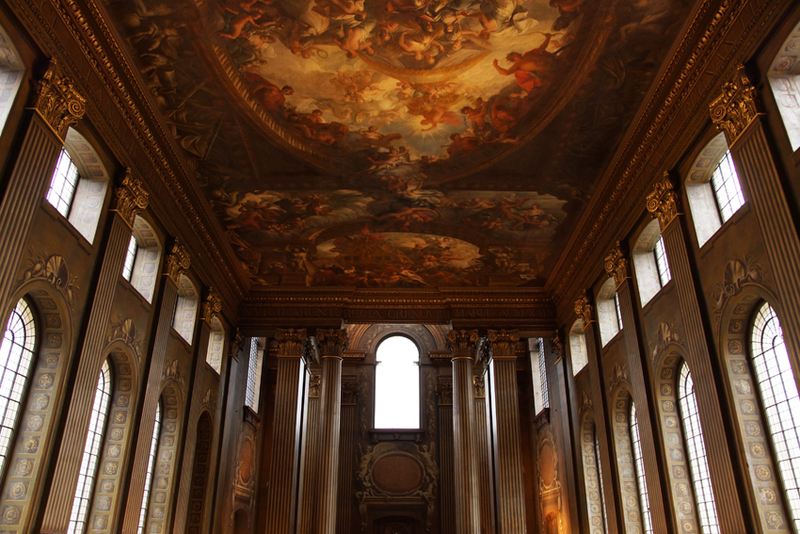 Step into the hall, and at first sight its walls and ceilings are covered in painting. 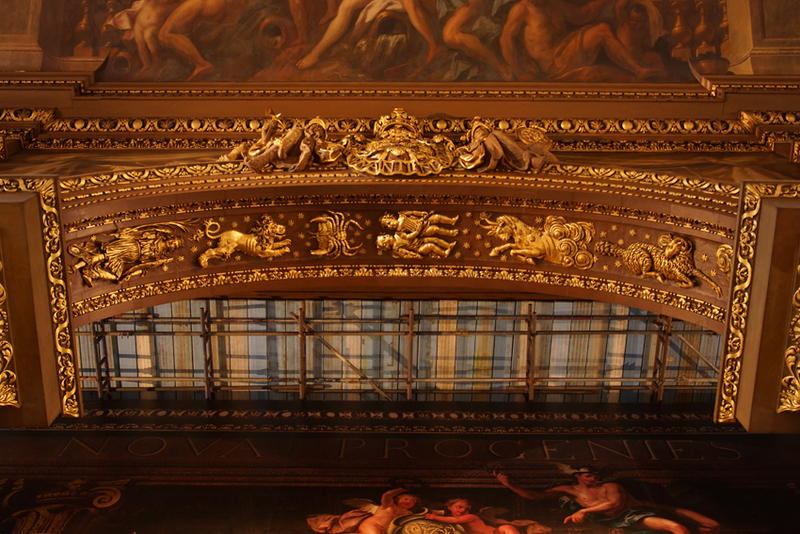 On closer inspection, the huge design on the west wall, depicting George I and his family surrounded by flattering symbolism, is actually a reproduction hanging in front of the original. 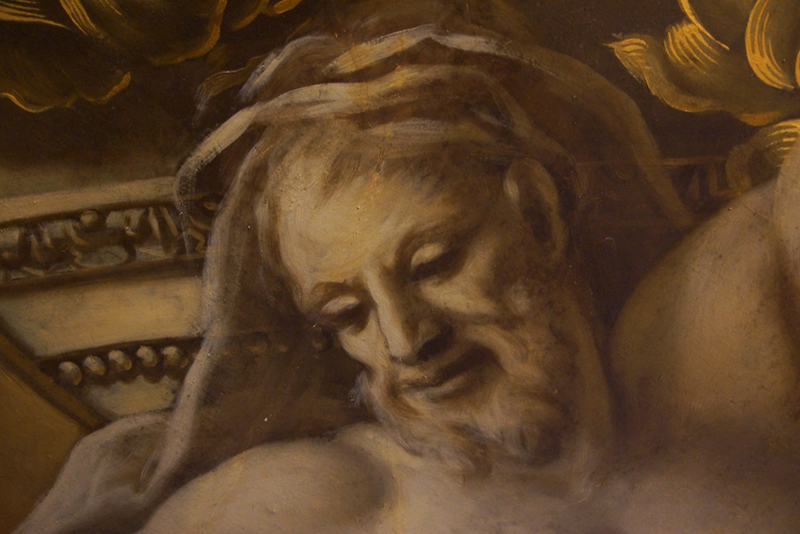 As part of a major conservation programme, the painting is being cleaned. 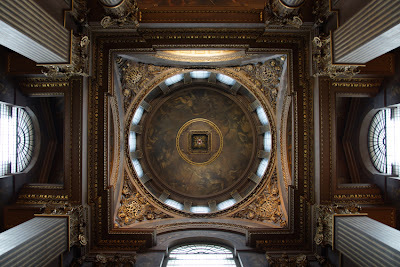 Look up and you catch a glimpse of the scaffolding. 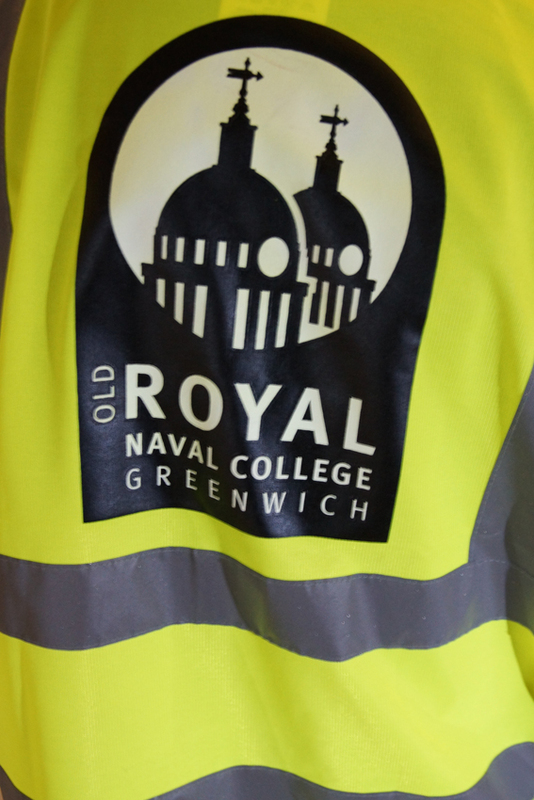 If you're lucky, and have booked a place on one of the regular free tours, you'll be taken behind the scenes, given a hard hat and high-visibility vest, and allowed to ascend the scaffolding to see the conservators at work. I went along and not only learned about the careful inspection and cleaning taking place, but also got a much closer look at the images than is usually possible. 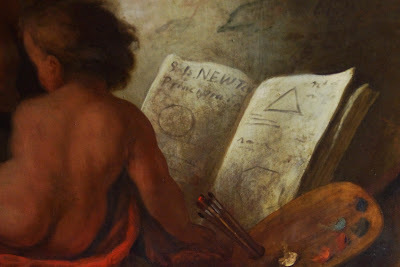 A book is revealed to be Newton's Principia, with diagrams sketched on its pages. 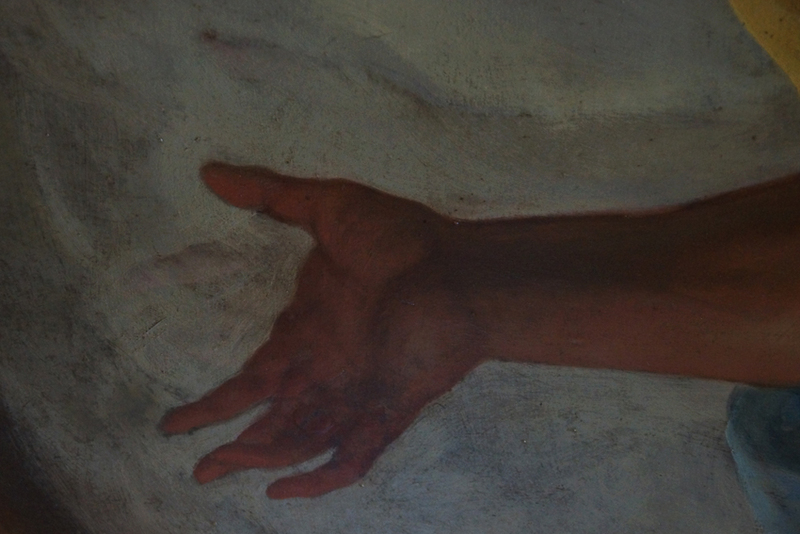 An outstretched hand is almost imperceptibly shadowed by a ghostly version of itself - the original limb, later overpainted. 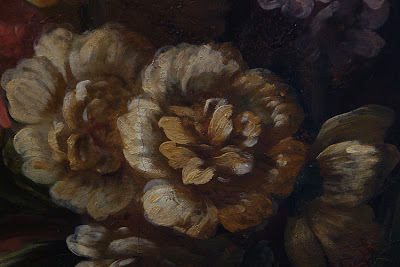 Not every brushstroke is Thornhill's: he worked with a team of artists, some specialising in particular subjects such as flowers. 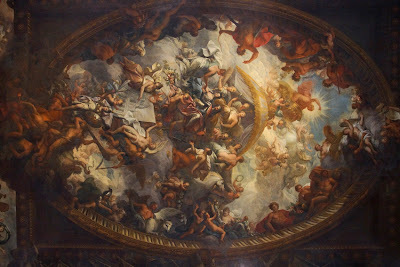 The architectural background was painted first, then the figures. 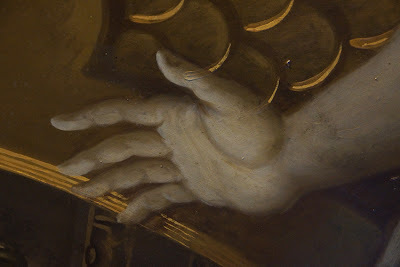 Sometimes, that is obvious at close range: here, background details show through an ethereally pale hand. They painted directly onto the plaster, itself covering wooden laths. Some of these are visible at the edges, once the scaffolding puts you at eye-level with them. 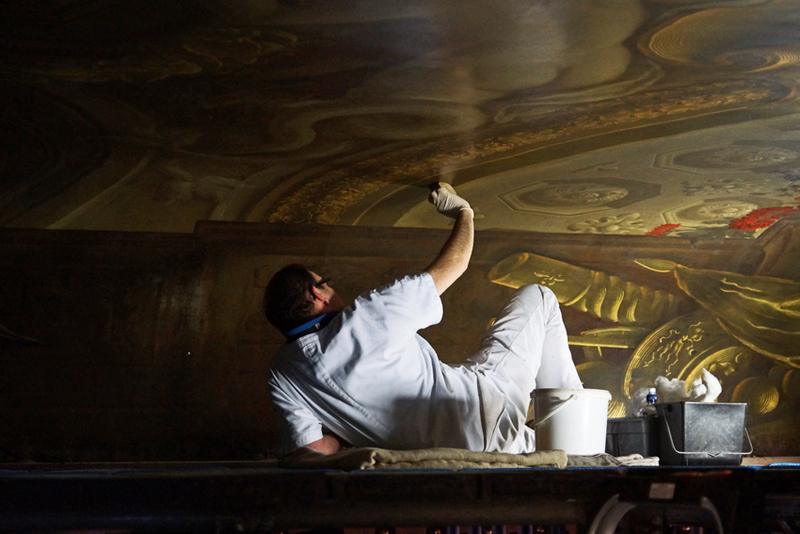 Carefully cleaning this huge and delicate work is a demanding task. 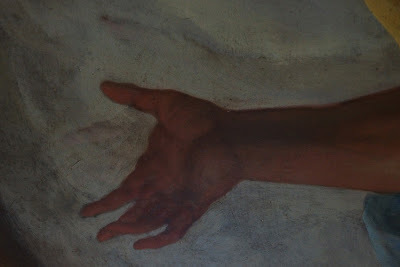 However, it is also much quicker than we perhaps imagine; modern materials and techniques help. 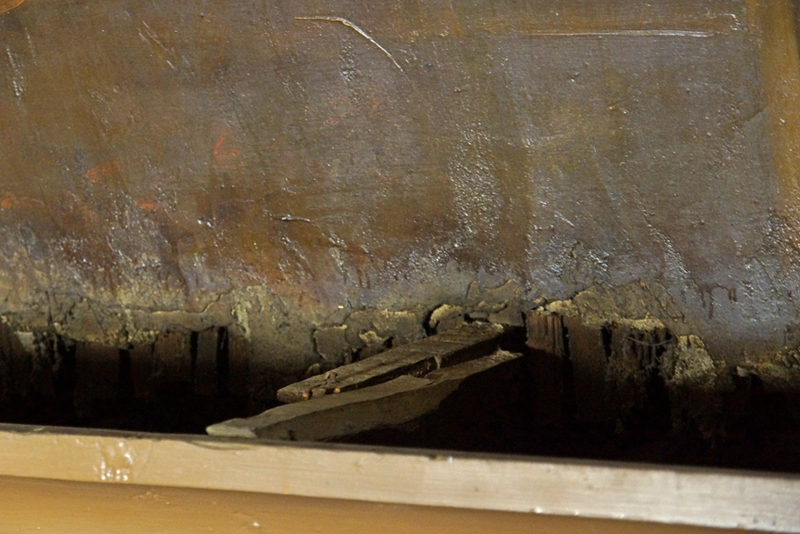 Some of the work has also proved to be in better condition than expected. The Old Royal Naval College deserve credit not only for ensuring that the conservation work does little to detract from visits to the hall, but also for allowing the public to take such a close look behind the scenes. There will be further stages to the project in future, if sufficient funding can be found. 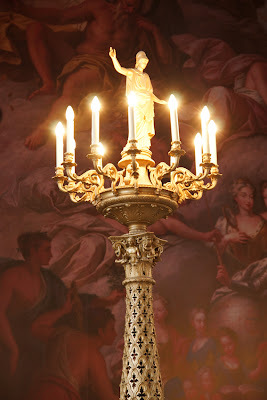 All donations are gratefully received - but entrance to the hall, and even the tours, remain free. 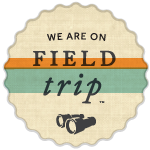 Further reading: Details of the tours are here and there's more about the appeal here. The Londonphile visited in January, so her photos show a slightly earlier stage of the work. More of my images are on flickr. 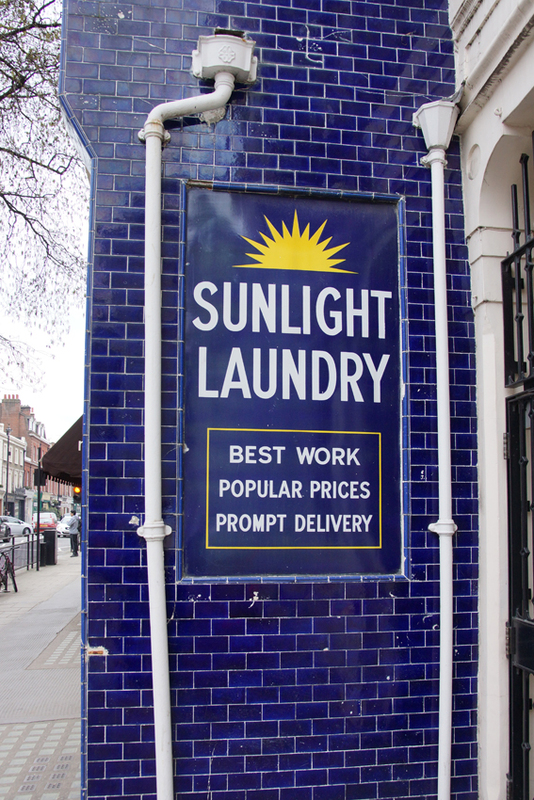 Although you can no longer wash your clothes here, the enamel sign for the Sunlight Laundry still brightens up Pimlico Road. The company was founded in 1900, and expanded through the city until 1928 when it merged with a competitor. 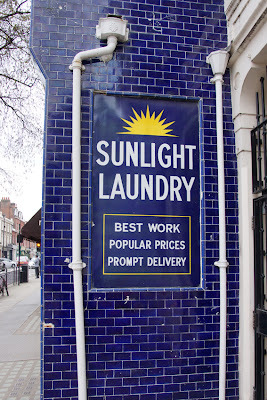 Now called Sunlight and Western, it became a national business; there was a further change in the 1960s when as National Sunlight Laundries its focus switched from the domestic market to professional clients such as hotels and factories. It is still operating today, and provides laundry services to hospitals as well as businesses. Scooby Doo appears to have visited Kew Gardens! He is actually one of the Queen's Beasts, ten heraldic animals representing the genealogy of Elizabeth II. 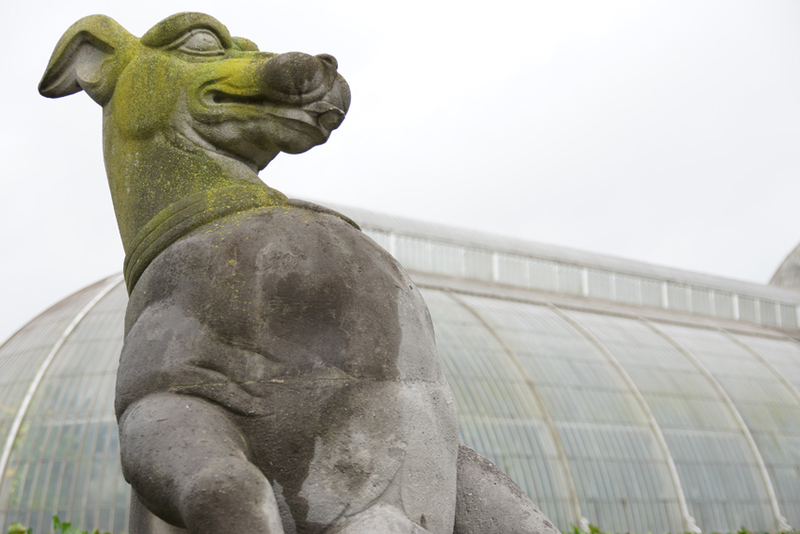 They (or rather, stone replicas of the plaster originals) stand guard in front of the Palm House. 'Scooby' is the White Greyhound of Richmond, originally the badge of the Earl of Richmond and later used by Henry VII.